The Gospel According to Matthew (Greek: Εὐαγγέλιον κατὰ Μαθθαῖον, translit. Euangélion katà Maththaîon; also called the Gospel of Matthew or simply, Matthew) is the first book of the New Testament and one of the three synoptic gospels. It tells how the promised Messiah, Jesus, rejected by Israel, finally sends the disciples to preach the gospel to the whole world. Most scholars believe it was composed between AD 80 and 90, with a range of possibility between AD 70 to 110 (a pre-70 date remains a minority view). The anonymous author was probably a male Jew, standing on the margin between traditional and non-traditional Jewish values, and familiar with technical legal aspects of scripture being debated in his time. Writing in a polished Semitic "synagogue Greek", he drew on three main sources: the Gospel of Mark, the hypothetical collection of sayings known as the Q source, and material unique to his own community, called the M source or "Special Matthew". The divine nature of Jesus was a major issue for the Matthaean community, the crucial element separating the early Christians from their Jewish neighbors; while Mark begins with Jesus' baptism and temptations, Matthew goes back to Jesus' origins, showing him as the Son of God from his birth, the fulfillment of Old Testament messianic prophecies. The title Son of David identifies Jesus as the healing and miracle-working Messiah of Israel (it is used exclusively in relation to miracles), sent to Israel alone. As Son of Man he will return to judge the world, an expectation which his disciples recognise but of which his enemies are unaware. As Son of God he is God revealing himself through his son, and Jesus proving his sonship through his obedience and example. The gospel reflects the struggles and conflicts between the evangelist's community and the other Jews, particularly with its sharp criticism of the scribes and Pharisees. Prior to the Crucifixion the Jews are called Israelites, the honorific title of God's chosen people; after it, they are called "Ioudaioi", Jews, a sign that through their rejection of the Christ the "Kingdom of Heaven" has been taken away from them and given instead to the church. 67 are notable fragments of Matthew. These are copies of copies. In the process of recopying, variations slipped in, different regional manuscript traditions emerged, and corrections and adjustments were made. Modern textual scholars collate all major surviving manuscripts, as well as citations in the works of the Church Fathers, in order to produce a text which most likely approximates to the lost autographs. The gospel itself does not specify an author, but he was probably a male Jew, standing on the margin between traditional and non-traditional Jewish values, and familiar with technical legal aspects of scripture being debated in his time. The majority of modern scholars believe that Mark was the first gospel to be composed and that Matthew (who includes some 600 of Mark's 661 verses) and Luke both drew upon it as a major source for their works. The author of Matthew did not, however, simply copy Mark, but used it as a base, emphasising Jesus' place in the Jewish tradition and including other details not covered in Mark. An additional 220 (approximately) verses, shared by Matthew and Luke but not found in Mark, from a second source, a hypothetical collection of sayings to which scholars give the name "Quelle" ("source" in the German language), or the Q source. This view, known as the Two-source hypothesis (Mark and Q), allows for a further body of tradition known as "Special Matthew", or the M source, meaning material unique to Matthew; this may represent a separate source, or it may come from the author's church, or he may have composed these verses himself. The author also had the Greek scriptures at his disposal, both as book-scrolls (Greek translations of Isaiah, the Psalms etc.) and in the form of "testimony collections" (collections of excerpts), and, if Papias is correct, probably oral stories of his community. These sources were predominantly in Greek, but mostly not from any known version of the Septuagint; a few scholars hold that some of them may have been Greek translations of older Hebrew or Aramaic sources. The majority view among scholars is that Matthew was a product of the last quarter of the 1st century. [Notes 1] This makes it a work of the second generation of Christians, for whom the defining event was the destruction of Jerusalem and the Temple by the Romans in AD 70 in the course of the First Jewish–Roman War (AD 66–73); from this point on, what had begun with Jesus of Nazareth as a Jewish messianic movement became an increasingly Gentile phenomenon evolving in time into a separate religion. The Christian community to which Matthew belonged, like many 1st-century Christians, was still part of the larger Jewish community: hence the designation Jewish Christian to describe them. The relationship of Matthew to this wider world of Judaism remains a subject of study and contention, the principal question being to what extent, if any, Matthew's community had cut itself off from its Jewish roots. Certainly there was conflict between Matthew's group and other Jewish groups, and it is generally agreed that the root of the conflict was the Matthew community's belief in Jesus as the Messiah and authoritative interpreter of the law, as one risen from the dead and uniquely endowed with divine authority. The author of Matthew wrote for a community of Greek-speaking Jewish Christians located probably in Syria (Antioch, the largest city in Roman Syria and the third-largest in the empire, is often mentioned). 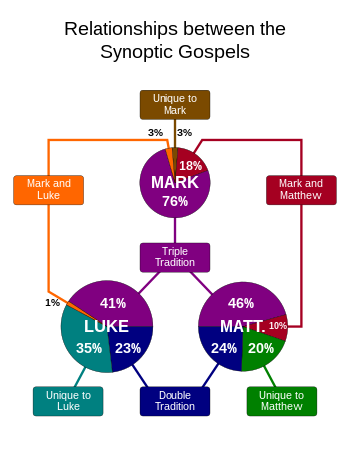 Unlike Mark, Matthew never bothers to explain Jewish customs, since his intended audience was a Jewish one; unlike Luke, who traces Jesus' ancestry back to Adam, father of the human race, he traces it only to Abraham, father of the Jews; of his three presumed sources only "M", the material from his own community, refers to a "church" (ecclesia), an organised group with rules for keeping order; and the content of "M" suggests that this community was strict in keeping the Jewish law, holding that they must exceed the scribes and the Pharisees in "righteousness" (adherence to Jewish law). Writing from within a Jewish-Christian community growing increasingly distant from other Jews and becoming increasingly Gentile in its membership and outlook, Matthew put down in his gospel his vision "of an assembly or church in which both Jew and Gentile would flourish together". Matthew, alone among the gospels, alternates five blocks of narrative with five of discourse, marking each off with the phrase "When Jesus had finished..." (see Five Discourses of Matthew). Some scholars see in this a deliberate plan to create a parallel to the first five books of the Old Testament; others see a three-part structure based around the idea of Jesus as Messiah; or a set of weekly readings spread out over the year; or no plan at all. Davies and Allison, in their widely used commentary, draw attention to the use of "triads" (the gospel groups things in threes), and R. T. France, in another influential commentary, notes the geographic movement from Galilee to Jerusalem and back, with the post-resurrection appearances in Galilee as the culmination of the whole story. The Gospel of Matthew begins with the words "The Book of Genealogy [in Greek, "Genesis"] of Jesus Christ", deliberately echoing the words of Genesis 2:4 in the Old Testament in Greek. [Notes 2] The genealogy tells of Jesus' descent from Abraham and King David and the miraculous events surrounding his virgin birth,[Notes 3] and the infancy narrative tells of the massacre of the innocents, the flight into Egypt, and eventual journey to Nazareth. The first narrative section begins. John baptizes Jesus, and the Holy Spirit descends upon him. Jesus prays and meditates in the wilderness for forty days, and is tempted by Satan. His early ministry by word and deed in Galilee meets with much success, and leads to the Sermon on the Mount, the first of the discourses. The sermon presents the ethics of the kingdom of God, introduced by the Beatitudes ("Blessed are..."). It concludes with a reminder that the response to the kingdom will have eternal consequences, and the crowd's amazed response leads into the next narrative block. From the authoritative words of Jesus the gospel turns to three sets of three miracles interwoven with two sets of two discipleship stories (the second narrative), followed by a discourse on mission and suffering. Jesus commissions the Twelve Disciples and sends them to preach to the Jews, perform miracles, and prophesy the imminent coming of the Kingdom, commanding them to travel lightly, without staff or sandals. Opposition to Jesus comes to a head with accusations that his deeds are done through the power of Satan; Jesus in turn accuses his opponents of blaspheming the Holy Spirit. The discourse is a set of parables emphasising the sovereignty of God, and concluding with a challenge to the disciples to understand the teachings as scribes of the kingdom of heaven. (Matthew avoids using the holy word God in the expression "Kingdom of God"; instead he prefers the term "Kingdom of Heaven", reflecting the Jewish tradition of not speaking the name of God). The fourth narrative section reveals that the increasing opposition to Jesus will result in his crucifixion in Jerusalem, and that his disciples must therefore prepare for his absence. The instructions for the post-crucifixion church emphasize responsibility and humility. (This section contains Matthew 16:13–19, in which Simon, newly renamed Peter, (πέτρος, petros, meaning "stone"), calls Jesus "the Christ, the son of the living God", and Jesus states that on this "bedrock" (πέτρα, petra) he will build his church: this passage forms the foundation for the papacy's claim of authority). Jesus travels toward Jerusalem, and the opposition intensifies: he is tested by Pharisees as soon as he begins to move towards the city, and when he arrives he is soon in conflict with the Temple's traders and religious leaders. He teaches in the Temple, debating with the chief priests and religious leaders and speaking in parables about the Kingdom of God and the failings of the chief priests and the Pharisees. The Herodian caucus also become involved in a scheme to entangle Jesus (Matthew 22:15–16), but Jesus' careful response to their enquiry, "Render therefore to Caesar the things that are Caesar’s, and to God the things that are God’s" (Matthew 22:21), leaves them marveling at his words (Matthew 22:22). The disciples ask about the future, and in his final discourse (the Olivet Discourse) Jesus speaks of the coming end. There will be false Messiahs, earthquakes, and persecutions, the sun, moon, and stars will fail, but "this generation" will not pass away before all the prophecies are fulfilled. The disciples must steel themselves for ministry to all the nations. At the end of the discourse, Matthew notes that Jesus has finished all his words, and attention turns to the crucifixion. The events of Jesus' last week occupy a third of the content of all four gospels. Jesus enters Jerusalem in triumph and drives the money changers from the temple, holds a last supper, prays to be spared the coming agony (but concludes "if this cup may not pass away from me, except I drink it, thy will be done"), and is betrayed. He is tried by the Jewish leaders (the Sanhedrin) and before Pontius Pilate, and Pilate washes his hands to indicate that he does not assume responsibility. Jesus is crucified as king of the Jews, mocked by all. On his death there is an earthquake, the veil of the Temple is rent, and saints rise from their tombs. Mary Magdalene and another Mary discover the empty tomb, guarded by an angel, and Jesus himself tells them to tell the disciples to meet him in Galilee. After the resurrection the remaining disciples return to Galilee, "to the mountain that Jesus had appointed", where he comes to them and tells them that he has been given "all authority in heaven and on Earth." He gives the Great Commission: "Therefore go and make disciples of all the nations, baptizing them in the name of the Father and of the Son and of the Holy Spirit, teaching them to obey everything that I have commanded you". Jesus will be with them "to the very end of the age". Christology is the theological doctrine of Christ, "the affirmations and definitions of Christ's humanity and deity". There are a variety of Christologies in the New Testament, albeit with a single centre—Jesus is the figure in whom God has acted for mankind's salvation. Matthew has taken over his key Christological texts from Mark, but sometimes he has changed the stories he found in Mark, giving evidence of his own concerns. The title Son of David identifies Jesus as the healing and miracle-working Messiah of Israel (it is used exclusively in relation to miracles), and the Jewish messiah is sent to Israel alone. As Son of Man he will return to judge the world, a fact his disciples recognise but of which his enemies are unaware. As Son of God he is named Immanuel (God with us) (Matthew 1:23), God revealing himself through his son, and Jesus proving his sonship through his obedience and example. The gospel has been interpreted as reflecting the struggles and conflicts between the evangelist's community and the other Jews, particularly with its sharp criticism of the scribes and Pharisees. Prior to the Crucifixion the Jews are called Israelites, the honorific title of God's chosen people; after it, they are called "Ioudaioi", Jews, a sign that through their rejection of the Christ the "Kingdom of Heaven" has been taken away from them and given instead to the church. The divine nature of Jesus was a major issue for the community of Matthew, the crucial element marking them from their Jewish neighbors. Early understandings of this nature grew as the gospels were being written. Before the gospels, that understanding was focused on the revelation of Jesus as God in his resurrection, but the gospels reflect a broadened focus extended backwards in time. The gospel of Mark recounts prior revelations in Jesus' lifetime on earth, at his baptism and transfiguration. Matthew and Luke go back further still, showing Jesus as the Son of God from his birth. Matthew more than all the other gospels identifies how his coming to earth was the fulfillment of many Old Testament prophecies. Finally John calls God the Word (Jesus) pre-existent before creation, and thus before all time. Matthew is a creative reinterpretation of Mark, stressing Jesus' teachings as much as his acts, and making subtle changes in order to stress his divine nature: for example, Mark's "young man" who appears at Jesus' tomb becomes "a radiant angel" in Matthew. The miracle stories in Mark do not demonstrate the divinity of Jesus, but rather confirm his status as an emissary of God (which was Mark's understanding of the Messiah). There is a broad disagreement over chronology between Matthew, Mark and Luke on one hand and John on the other: all four agree that Jesus' public ministry began with an encounter with John the Baptist, but Matthew, Mark and Luke follow this with an account of teaching and healing in Galilee, then a trip to Jerusalem where there is an incident in the Temple, climaxing with the crucifixion on the day of the Passover holiday. John, by contrast, puts the Temple incident very early in Jesus' ministry, has several trips to Jerusalem, and puts the crucifixion immediately before the Passover holiday, on the day when the lambs for the Passover meal were being sacrificed in Temple. ^ This view is based on three arguments: (a) the setting reflects the final separation of Church and Synagogue, about 85 AD; (b) it reflects the capture of Jerusalem and destruction of the Temple by the Romans in 70 AD; (c) it uses Mark, usually dated around 70 AD, as a source. (See R.T France (2007), "The Gospel of Matthew", p. 18.) France himself is not convinced by the majority – see his Commentary, pp. 18–19. ^ France, p. 26 note 1, and p. 28: "The first two words of Matthew's gospel are literally "book of genesis". ^ France, p. 28 note 7: "All MSS and versions agree in making it explicit that Joseph was not Jesus' father, with the one exception of sys, which reads "Joseph, to whom was betrothed Mary the virgin, begot Jesus." ^ Matthew 1:1 "Jesus the Messiah"
^ Luz 2005, pp. 249–50. ^ Duling 2010, pp. 298–99. ^ France 2007, p. 19. ^ a b Duling 2010, p. 302. ^ Duling 2010, p. 306. ^ Burkett 2002, p. 175. ^ a b Peppard 2011, p. 133. ^ a b Luz 1995, pp. 86, 111. ^ a b Luz 1995, pp. 91, 97. ^ a b Luz 1995, p. 93. ^ a b Burkett 2002, p. 182. ^ a b Strecker 2000, pp. 369–70. ^ Turner 2008, pp. 6–7. ^ a b Senior 1996, p. 22. ^ Harrington 1991, pp. 5–6. ^ McMahon 2008, p. 57. ^ Beaton 2005, p. 116. ^ Nolland 2005, p. 3. ^ Duling 2010, p. 314. ^ Casey 2010, pp. 87–88. ^ Davies & Allison 1988, pp. 12–13. ^ Davies & Allison 1988, p. 128. ^ Scholtz 2009, pp. 34–35. ^ Saldarini 1994, p. 4. ^ Senior 2001, pp. 7–8, 72. ^ Senior 2001, p. 11. ^ Nolland 2005, p. 18. ^ Burkett 2002, pp. 180–81. ^ Senior 2001, p. 19. ^ Turner 2008, p. 9. ^ Davies & Allison 1988, pp. 59–61. ^ Davies & Allison 1988, pp. 62ff. ^ France 2007, pp. 2ff. ^ Turner 2008, p. 101. ^ Turner 2008, p. 226. ^ a b Harris 1985. ^ Turner 2008, p. 285. ^ Browning 2004, p. 248. ^ Turner 2008, p. 265. ^ a b Turner 2008, p. 445. ^ Turner 2008, p. 613. ^ Turner 2008, pp. 687–88. ^ Levison & Pope-Levison 2009, p. 167. ^ Fuller 2001, pp. 68–69. ^ Tuckett 2001, p. 119. ^ Davies & Allison 1997, p. 722. ^ Senior 2001, pp. 17–18. ^ France 2007, pp. 179–81, 185–86. ^ Beaton 2005, p. 117. ^ Beaton 2005, p. 123. ^ Levine 2001, p. 373. Allison, D.C. (2004). Matthew: A Shorter Commentary. T&T Clark. ISBN 978-0-567-08249-7. Davies, William David; Allison, Dale C. (1988). A Critical and Exegetical Commentary on the Gospel According to Saint Matthew. I: Introduction and Commentary on Matthew I–VII. T&T Clark Ltd. ISBN 9780567094810. ——; —— (1999) . A Critical and Exegetical Commentary on the Gospel According to Saint Matthew. II: Commentary on Matthew VIII–XVIII. T&T Clark Ltd. ISBN 9780567095459. ——; —— (1997). A Critical and Exegetical Commentary on the Gospel According to Saint Matthew. III: Commentary on Matthew XIX–XXVIII. T&T Clark Ltd. ISBN 9780567085184. Duling, Dennis C. (2010). "The Gospel of Matthew". In Aune, David E. (ed.). The Blackwell Companion to the New Testament. Wiley-Blackwell. ISBN 978-1-4051-0825-6. France, R.T (2007). The Gospel of Matthew. Eerdmans. p. 19. ISBN 978-0-8028-2501-8. Luz, Ulrich (1989). Matthew 1–7. Matthew: A Commentary. 1. Translated by Linss, Wilhelm C. Minneapolis: Fortress Press. ISBN 9780806624020. —— (2001). Matthew 8–20. Matthew: A Commentary. 2. Minneapolis: Fortress Press. ISBN 9780800660345. —— (2005). Matthew 21–28. Matthew: A Commentary. 3. Minneapolis: Fortress Press. ISBN 9780800637705. Nolland, John (2005). The Gospel of Matthew: A Commentary on the Greek Text. Eerdmans. ISBN 978-0-8028-2389-2. Saunders, Stanley P. (2009). "Matthew". In O’Day, Gail (ed.). Theological Bible Commentary. Westminster John Knox Press. ISBN 978-0664227111. —— (1987). The New Testament in its literary environment. Westminster John Knox Press. ISBN 978-0-664-25018-8. Browning, W.R.F (2004). Oxford Dictionary of the Bible. Oxford University Press. ISBN 978-0-19-860890-5. —— (2009). Misquoting Jesus: The Story Behind Who Changed the Bible and Why. Harper Collins. ISBN 9780061977022. —— (2012). Did Jesus Exist? : The Historical Argument for Jesus of Nazareth. HarperCollins. ISBN 978-0-06-220460-8. Fuller, Reginald H. (2001). "Biblical Theology". In Metzger, Bruce M.; Coogan, Michael D. (eds.). The Oxford Guide to Ideas & Issues of the Bible. Oxford University Press. ISBN 9780195149173. Hagner, D.A. (1986). "Matthew, Gospel According to". In Bromiley, Geoffrey W. (ed.). International Standard Bible Encyclopedia, Vol. 3: K-P. Wm. B. Eerdmans. pp. 280–88. ISBN 978-0-8028-8163-2. Levine, Amy-Jill (2001). "Visions of kingdoms: From Pompey to the first Jewish revolt". In Coogan, Michael D. (ed.). The Oxford History of the Biblical World. Oxford University Press. ISBN 978-0-19-513937-2. Levison, J.; Pope-Levison, P. (2009). "Christology". In Dyrness, William A.; Kärkkäinen, Veli-Matti (eds.). Global Dictionary of Theology. InterVarsity Press. ISBN 9780830878116. —— (1995). The Theology of the Gospel of Matthew. Cambridge University Press. ISBN 978-0-521-43576-5. Peppard, Michael (2011). The Son of God in the Roman World: Divine Sonship in Its Social and Political Context. Oxford University Press. ISBN 9780199753703. Saldarini, Anthony (2003). "Matthew". Eerdmans commentary on the Bible. ISBN 0802837115. , in Dunn, James D.G. ; Rogerson, John William (2003). Eerdmans Commentary on the Bible. Eerdmans. ISBN 978-0-8028-3711-0. Sanford, Christopher B. (2005). Matthew: Christian Rabbi. Author House. ISBN 9781420883718. Scholtz, Donald (2009). Jesus in the Gospels and Acts: Introducing the New Testament. Saint Mary's Press. ISBN 9780884899556. Wallace, Daniel B., ed. (2011). Revisiting the Corruption of the New Testament: Manuscript, Patristic, and Apocryphal Evidence. Text and canon of the New Testament. Kregel Academic. ISBN 9780825489068.